What are walnuts? About the ingredient walnuts. Including 2,147 recipes with walnuts, nutrition data, and where to find it. The walnut is a hearty heart-healthy snack on its own and adds a wholesome bit of crunch to a 'wide variety of dishes. Encased in a grooved, light-brown shell, the walnut kernel is formed by two off-white, uneven lobes and has a mildly sweet and sometimes bitter taste. Most of the nutritional value of walnuts is in their polyunsaturated fats, which also make walnuts quite perishable. When walnuts remain in their shells, they can last a few months unrefrigerated in a cool, dark place, up to six months refrigerated or a year frozen. Unshelled nuts are the best choice for long-term storage. Shelled walnuts should be stored in an airtight container and can last up to four months in the refrigerator or longer if kept frozen. Walnuts have a wonderful earthy and savory flavour with a slightly waxy texture that works well in both sweet and savory recipes. They give cakes and brownies as well as salads and sides a delightful crunch. Many consider walnuts a super-food as they contain Omega-3 which is beneficial to heart health. Just a handful a day can make a difference. Walnuts go brilliantly with cheese, honey and fruits. Easy walnut treats Caramelize walnut halves in a skillet with some sugar and a bit of water. The sticky and crunchy result is perfect on top of ice cream, pies or even some low-fat ricotta cheese. 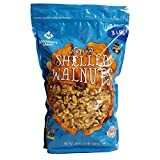 Diamond of California, Shelled Walnuts, 16 oz. SHELLED WALNUTS IN CONVENIENT SIZES - Contains 1 - 16 oz. bag of Shelled Walnuts PERFECT PORTION SIZES - About 4 cups (15 servings per container) of Premium, California-grown, Chandler variety walnuts - known for their alluring light color, crisp tangy exterior, and light, buttery flavor NON-GMO PROJCT VERIFIED, NO CHOLESTEROL, NO SODIUM - 2.5g Omega-3s and only 4g Carbohydrates per serving, Certified Kosher FARM TO TABLE FLAVOR - Harvested & Packaged Fresh in California's Central Valley MADE FOR HOMEMADE - Diamond Nuts are unseasoned and perfect for baking, cooking, snacking or adding as a topping to your favorite salad, dessert, yogurt, cereal, or granola. We believe that adding nuts makes good food even better! Walnuts are usually found in the baking supplies section or aisle of the grocery store or supermarket. Walnuts are a member of the Nut and Seed Products USDA nutritional food group. How much do walnuts weigh? There are 2219 recipes that contain this ingredient.